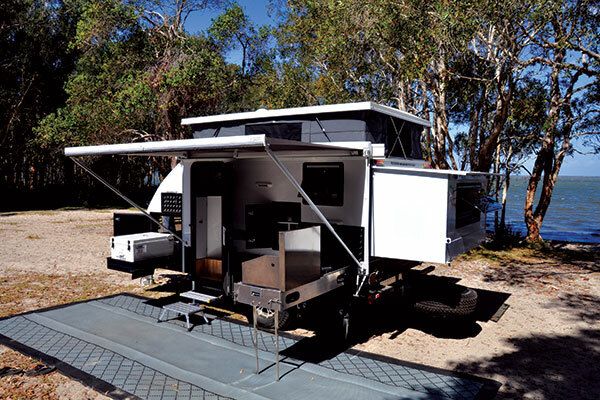 There’s something about recent camper trailer manufacturing that, to me, is all about world-leading innovation. It’s refreshing to see raw ingenuity come to life from the fledgling ideas and experiences of smart Aussie campers simply going about their business, camping. 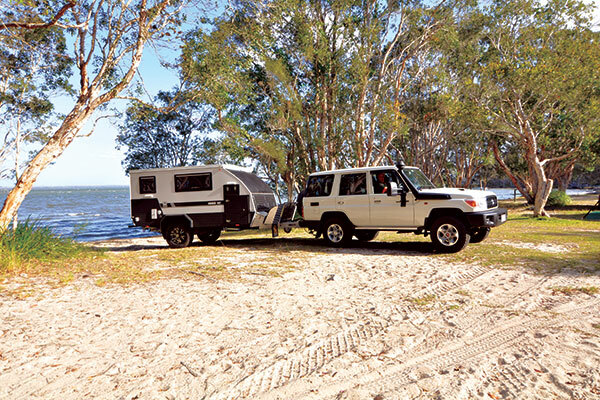 As popularity leans more towards hybrids, so too have Queensland’s Jawa Camper Trailers, with their Trax 12 and larger Trax 15 models leading the charge. Take the time to have a second and maybe a third look at the Trax 12 that we recently took for a test on the Sunshine Coast; you’re in for a pleasant surprise. I’m all about easy, especially when I’m camping. However I do appreciate some level of comfort especially on a long road or an extended holiday in an ideal location. The Trax 12 supplies all of this with an exceptionally easy three minute set-up for a comfortable overnighter, or maybe a couple of minutes more to wind out the awning. It has a relatively light weight of 1690kg Tare, a solid aluminium body with pop-up fibreglass roof, a solid offroad capable trailer with independent trailing arm suspension, 200L of water and plenty of power. There's also plenty of cooking space, refrigeration and personal facilities, a few creature comforts and even an extendable bed unit that creates immense volume for a fully enclosed queen size bed. The Jawa Trax 12 is a tough little home away from home that is ready to go the hard yards on a challenging track, but also provides easy and appealing accommodation for satisfying nights in a remote location. It is built on a tough box section chassis most evident from the large 150x50x4mm A-frame drawbar out front with a 360 degree offroad heavy duty ARC ball hitch (rated 3.5T), and heavy duty independent coil suspension with double shock absorbers either side. The Trax 12 has a Tare weight of 1690kg and an ATM of 2290kg with 136kg ball weight unloaded. Its overall dimensions are only 5.5mx2050mm wide so it is quite easy to tow and weighs little more than most forward and rear fold campers. The overall height on the road is 2.2m so it will cop a little bit of wind over the top of most towing vehicles however the front of the van is quite aerodynamically designed to reduce drag. Aesthetically the Trax 12 is quite a nice looking unit with its white aluminium composite body and black window frames, drawbar and checkerplate protective panels as offsets. Out in front is a replaceable mesh stone guard with checkerplate wings and behind it is a pair of tool/firewood boxes made of the same alloy that will resist wear in this highly abrasive area. There’s also twin gas bottle and twin jerry can holders before you get to a large doorway in the front of the main camper body. One has access to the fridge compartment on the kerb side and the other houses the electrical control box complete with volt and amp meter, 240V and 12V circuit breakers and switch gear, 12V outlets plus independent 12V circuit fuses. There are two 100A AGM batteries as standard charged via the Anderson plug to the towing vehicle or via the 200A portable solar panels, and a 30A battery charger is included (or upgrade to a Projecta 2510 ). 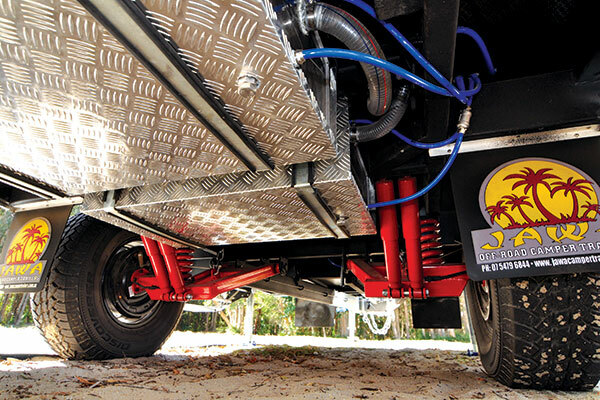 Underneath the trailer the galvanised drawbar extends well down the chassis around the forward spring hangers, and all of the welding appears to be well executed. There’s more alloy checkerplate in the underside floor up the front leading down to impact protected Zincanneal beyond. It rides on 265/75/R16 mud terrain tyres with attractive 6in stud alloy rims with 12in electric brakes. There are two 100L stainless steel water tanks giving plenty of life’s blood. They are well shrouded with checkerplate covers but I did feel the plumbing should be neatened just a little as I wouldn’t want to see a stray stump dragging out the flexible hoses. Other trailer features include a handbrake, a tough Ark jockey wheel, wind down stabilisers on each corner and engineered recovery points to the rear. Out in back is a swing down tailgate with single spare tyre wheel and tyre and this is beautifully balanced with gas struts making life easy. You need to drop the tailgate in order to assemble the extenda. We took more time choosing our campsite than we did assembling the Trax 12 including the awning! The basics are wind down the stabilisers to level (an electric drill and socket makes short work of that), drop the tailgate, lift the hinged rear wall panel and folding sides, pull out the bed base complete with the folding rear panel and clip it all in position. The whole extenda process could be done in about 30 seconds. Next we open the door, pull out the step and hop inside to lift the fibreglass roof with its easy spring loaded mechanism. That’s all you need for a quick overnighter. Full assembly is just as easy. Wind out the overhead awning, slide out the kitchen from the rear, plug in the Quick connect water and gas fittings, and pull out the fridge slide. Don't forget the music from the Bluetooth stereo, fold out your camp chairs and find your drink holders! You can have a break for lunch on the road just as easily, including enjoying the shade from the 4x2m awning (optional walls). Jawa have standardised the stainless steel kitchen available in all their campers. It slides out easily from behind the doorway that features automotive seals and waterproof compression locks, as do all of the access hatches. The kitchen has a pressurised hot and cold water mixer for the stainless sink fired by a Duetto hot water system (optional extra), which heats the kitchen and outside shower. Jawa supply portable gas hot water as a bonus. 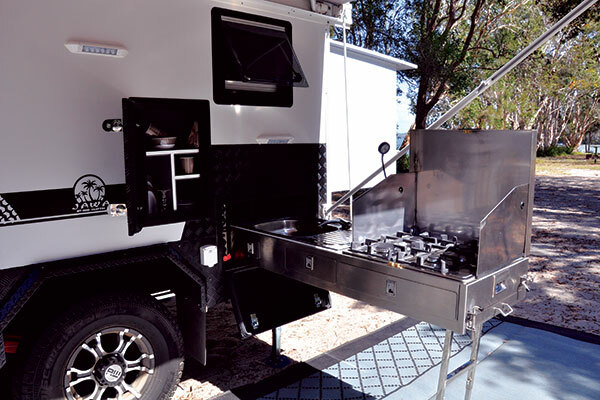 There’s a four-burner gas stove with windshield plus three utensil drawers, a pull-out bench extension and adjustable stabilising legs. There’s even a 240V outlet plus 12V outlets next to the kitchen in case you have an electric kettle or frypan. Slightly forward is another compartment that can be used for bowls, plates or pantry. Up in front is the large pressurised compartment for the fridge slide that is large enough to take a 110L Evakool or similar, plus a full width enclosed pole carrier storage compartment above. We enter the hybrid through a large and secure side door with separate security screens. I had to duck my head a little on the way in, and those taller than me (six foot) will notice this. My interest was straight onto how well the big bed sat within its extenda and I was pleasantly surprised. I like a big comfortable bed and this is a ripper. The mattress is two pieces to accommodate the slide out section and it is an inner spring that measures a large Queen of 1520x2040mm. There is plenty of head room even above the extension, and heaps of light and ventilation options so you won’t feel at all claustrophobic. The soft section of the pop-top has zippered windows with fine mesh flyscreens all around, and the fibreglass roof provides added insulation and drop lighting options. There are high quality windows either side of the bed, and at the head as well, all with sliding awnings and flyscreens. It would be a lovely place to awaken looking out over a trickling stream or majestic view. Under the bed is a compartment for a porta potti that can be kept inside. I’d personally take it outside to the 16oz canvas toilet/shower tent that comes complete with a portable gas hot water unit as part of their White Series “Show Special” kit. This it also contains solar panels, a padded vinyl stone guard for the front and the battery charger. Back inside there is a multi-use cabinet immediately to your left as you enter with a black stone laminate bench top that is common to all of the flat surfaces. It’s probably best described as a pantry but also has room for pots, pans and utensils, and is backed up by three more utility cabinets above the workspace. To your right is a proper wardrobe complete with some full length hanging space and shelving. Immediately ahead is the small convertible two person dinette with the table dropping down to form the base for a small bunk. 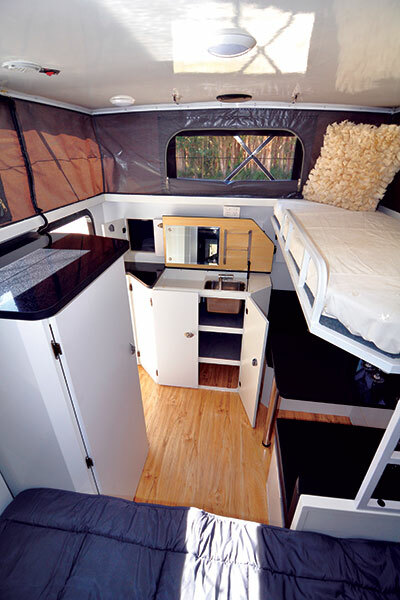 Overhead is a foldaway bunk making the van suitable to a family with up to two small children. If you have toddlers I reckon I’d be putting a little bit of webbing around the top bunk as a further restraint but overall the design works really well. 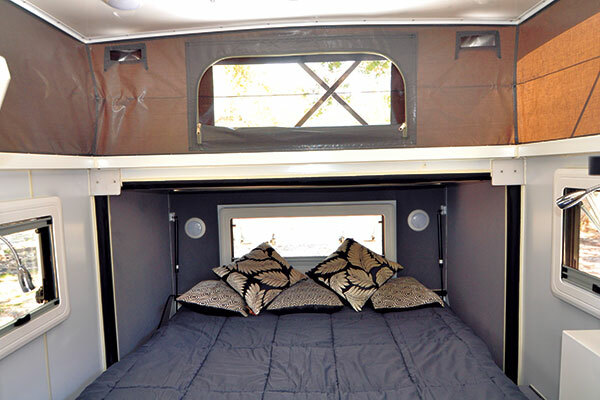 The Jawa Trax 12 has a good array of LED lighting both inside and out including individual reading lights to the Queen bed. There is another 240V outlet at the benchtop and multiple 12V and USB sockets plus a CD/MP3/USB/radio sound system that I believe has now been upgraded to Bluetooth. 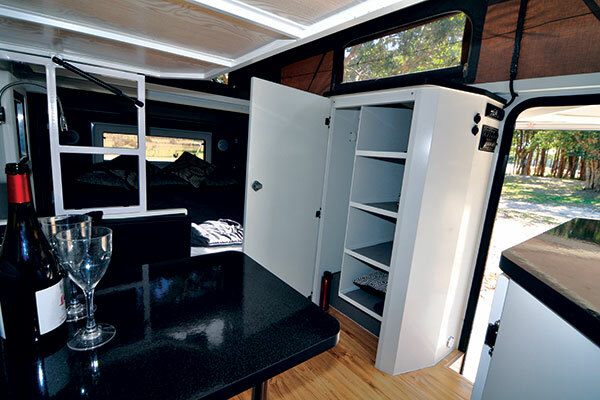 Jawa offers a huge array of options and accessories to provide you with your ideal package, including an internal bathroom with Thetford cassette toilet and shower that replaces the dinette and bunk beds and includes a small sofa bench opposite the wardrobe with swing around table. I have to admit the more I see in this mid-range hybrid market the more I like. I’m not a caravan tourer, and enjoy the freedom of travelling a little lightweight and with some considerable offroad ability. Plus I demand immediate, easy creature comforts or I lose interest quickly. The Jawa White Series Trax 12 hits this target with a bullseye and best of all, it comes at a reasonable cost with a long list of sensible equipment and options. This Jawa is really making Trax to be a best mate on your next journey. 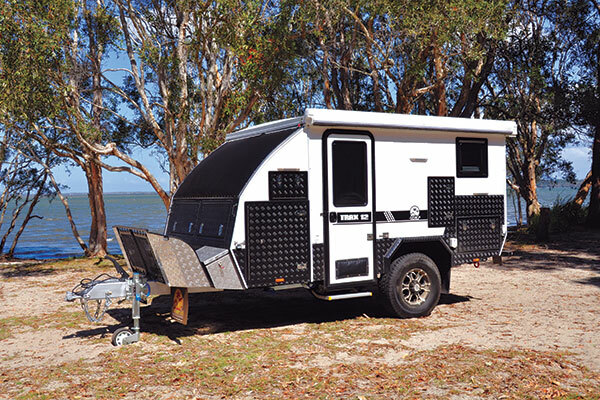 Check out the full review in issue #120 of Camper Trailer Australia magazine. Subscribe today for all the latest camper trailer news, reviews and travel inspiration.